ON INDICATED DATES WITHOUT CHERRY PICKING. of Mr. Cowan's work and not by Mr. Cowan. 2/3/2018 - On 9/2017 (see below) Dawa Raju of India submitted his Elliott Wave analysis of the SP500 using CycleTimer software. In this chart he updates that analysis to present. His original analysis showed potential resistance when Wave 5 = Wave 1. His current chart shows that the most recent top occurred when Wave 5 = Wave 3. Wave 2 = Wave 4 = 50% correction of preceding wave. 9/23/2017 - This chart was submitted by Dawa Raju of India. He is a long time student of Gann and Cowan. It is his analysis of the Elliott Wave and Fibonacci structure of the SP500 using CycleTimer software. 5/20/2017 - CycleTimer analysis using Cowan techniques shows the astro alignment in July to be very dangerous. 12/11/2016 - Has the 17-Year Cycle Bottomed? Shortly after the November, 2016 bottom we posted that a major bull advance was under way. Six months later the market has rocketed higher than anyone expected (except Stock Market Geometry). 1/18/2016 - Bradley F. Cowan published Pentagonal Time Cycle Theory in 2009 where he forecast late 2016 as a major stock market bottom. His based this forecast on the pentagonal subdivision of the 84-year cycle into five smaller 17-year cycles. The chart below updates the lunar cycle and Price by Degree posted last year. The most recent top coincided perfectly with prices arriving at the intersection of these 2 lines. 9/10/2015 - In May we began posting (see below) several charts warning that the Russell 2000 was up against Gann's Price x Degree. In July prices backed away from that resistance line for the last time and collapsed. The chart below shows the same Gann Price x Degree in the SP500. Prices rallied back up this resistance line at the 50% retracement. Also shown on this chart is a proprietary lunar cycle that coincides with market tops. 6/9/2015 (Chart Updated Again 6/15) - One month ago we posted (below) a chart of the Russell 2000 with Gann's Price by Degree. Since then, prices advanced back up to exactly touch that line and retreated. (Since 6/9 prices have again bounced off the Price x Degree). 5/9/2015 - The efficacy of Gann's "Price by Degree" in timing the SP500 has been well documented over the past year in the below posts. This same tool also timed the 4/27/2015 top in the Russell 2000. Since October 2014 the Russell had been following a linear trend until running into the Price x Degree. This top also coincided with the cycle shown below in the 2/25 post. 3/6/2015 - RIGHT AGAIN (See Below)! The 1/31 post was made the day before the bottom. The 2/25 post was made the day before the top. 2/25/2015 - Sometimes a simple static cycle is all you need. This chart shows a 2-month top-to-top cycle in the RUT for the past year. The start of every other month has seen selling. 1/8/2015 (Chart updated again 1/31/15) - This chart updates the two Gann lines previously shown in the SP500. Key areas since the last post are circled. A picture is worth 1000 words! 12/13/2014 - Told You So...Again. On 11/28 (see below) SMG staff posted that the SP500 had reached balance at the upper Gann Angle defining the trend since 2009. The warning was also given that the time count was at the critical 144 multiple that defined the duration of the 1994-2000 move. Prices have since dropped back down to the Price x Degree line first disclosed by Mr. Cowan in 2012. 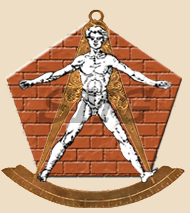 11/28/2014 - Anyone studying Cowan or Gann's works are familiar with the importance of 144. The total number of trading days during the 1994-2000 move was 1447. From the 2009 bottom through today it is 1444. The trend has followed Gann's 45 degree angle since the 2009 bottom, or one point per trading day. This angle represents the balancing of price and time. CycleTimer owners can play with this angle from various tops to find its exact location now. 11/4/2014 - This chart updates the SP500 with the previously shown WD Gann Price by Degree. Added to this chart are the 270 and 180 degree lines, which exactly defined the recent bottoms. CycleTimer owners can reproduce these lines by formatting to subdivide by 4. Doing this creates the "Squares". 10/1/2014 - Told You So! - On 8/30/2014 SMG staff posted WD Gann's Price by Degree for the SP500 on a 15-year monthly chart (see below). When combined with the 3rd 666 square off the 2009 bottom the trend reversed. 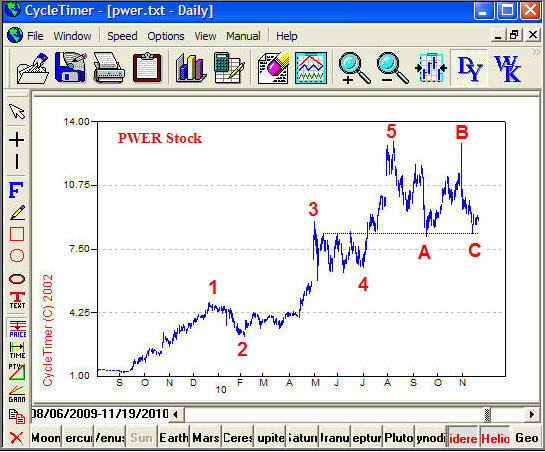 8/30/2014 - Below is an update of the chart sent to CycleTimer owners in 12/2012 showing WD Gann's Price by Degree. CycleTimer owners are encouraged to repeat this calculation. 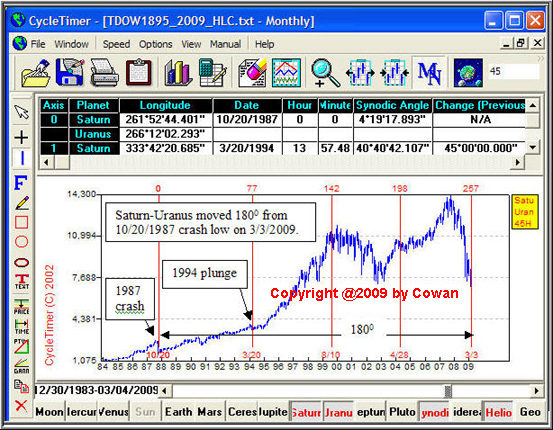 In Four-Dimensional Stock Market Structures and Cycles Cowan identified the Saturn 5-Year cycle using data back to the 1700's. The below chart uses CycleTimer to automatically calculate that cycle anchored at the 3/2000 top in the NASDAQ. The middle chart zooms in on the 2009-2014 5-Year Saturn cycle and adds Cowan's 5-Year Venus-Earth cycle. The bottom chart zooms in further on the top using daily data. 1/24/2014 - If you want to understand the January 2014 Stock Market drop look at Cowan's 2013+ Forecast (Page 4) which listed 1/18/2014 as a major cycle. He showed this natural cycle recurred at the tops in 8/1987, 1/1994, 2000, and 2008. BULL'S-EYE MR. COWAN! HIS 2013+ FORECAST SHOWS ONCE AGAIN WHY HE'S THE UNDISPUTED CYCLE ANALYSIS KING! In late December 2012 Mr. Cowan's 2013+ forecast was sent to CycleTimer owners. It listed 3 dates as critical in 2013, May 21 & 28, Mid-August, and October. The below chart of the DJIA shows the results. 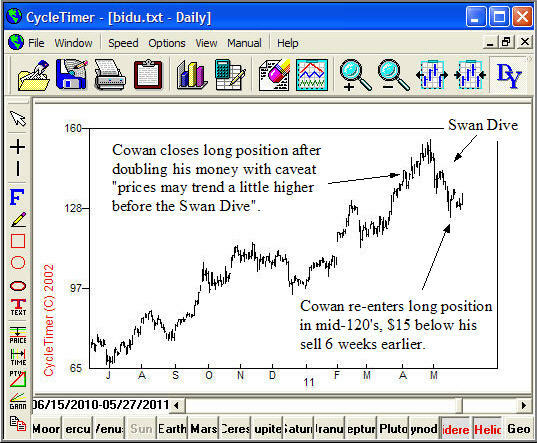 7/2013 - Why Cowan is the Undisputed King of Stock Market Analysis. And Why YOU MISSED OUT if You Did Not Get His 2013+ Market Forecast! Four and a half years ago, Cowan published Pentagonal Time Cycle Theory where he presented his independently discovered market cycle equation, based on the Square of Twelve. He used that equation, anchored 50 years in the past, to project the two cycle top dates shown below. In December, 2012 owners of CycleTimer software received his Market Forecast, which again forecast these exact dates as the top. That same newsletter included WD Gann's PricexDegree of the Moon's North Node used as price target. When these cycles and resistance lines met, circled below, the top was reached in both price and time. If you thought you were saving a few dollars by not buying CycleTimer and not receiving his forecast you were "Penny Wise But Pound Foolish". The few dollars spent would have been easily made in just a few hours shorting this market on Cowan's dates. CycleTimer owners who received Mr. Cowan's Market Forecast were presented in December with a chart of the SP500 and WD Gann's Price by Degree using the Moon's North Node. CycleTimer Intraday is used to update that chart below. 6/2/2012 - Silence Of The Lambs - Cowan Silences His Foolish Critics... Again. There is nothing like an endless string of dead-on accurate market calls to silence critics. Mr. Cowan has noted that those fighting the losing battle trying to discredit his work through ridiculous anonymous ad hominem attacks are the market bottom feeders. Typically these losers hang out in illegal file sharing websites looking for pirated books and software to steal. But even these pathetic losers have been quieted by Cowan's unmatched real-time public market calls posted on this website. Maybe they have finally realized what fools they have made of themselves, or maybe not. 5/5/2012 - You Were Warned! 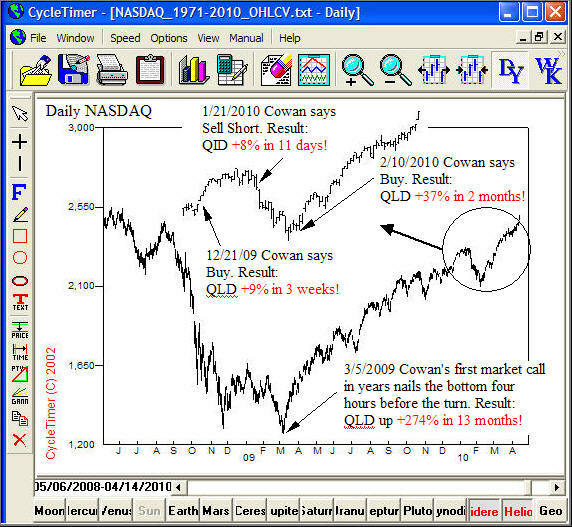 2 1/2 years ago, Cowan used his unique and independently discovered methods of cycle analysis to publish in Pentagonal Time Cycle Theory (p. 48 & 104) that May 2012 would be a major stock market cycle top. When the first top arrived real-time Cowan posted here (see 3/28 post below) warning again that a top was complete. He used this as a teaching opportunity to show how easily anyone can use his PTV to time market turns with the assistance of CycleTimer software. The technique was so simple and the results so undeniable that anyone unable to effectively use these techniques should not be trading, nor do their opinions merit attention. 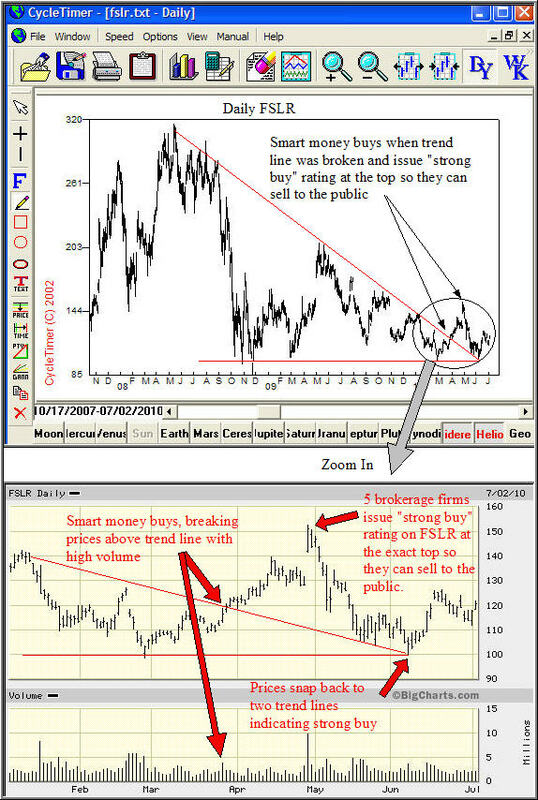 As typically occurs when new and unique methods of market analysis are made available to the public, many copy-cat analysts have copied Cowan's cycle analysis and tried to present it as their own. This is nothing new to Cowan as it was repeated over-and-over again after publication of his original work, Four-Dimensional Stock Market Structures And Cycles. Although "imitation is the sincerest form of flattery", intelligent analysts are advised to read the original text from which all the others are derived or risk a dangerous misinterpretation. Two weeks ago, at the top, Cowan identified the top using his PTVs (see below). Since then, the largest two week decline of the year has occurred. The accuracy of his PTV projection was better than 1%, which is well within the resolution of the SP500 data. His simple PTV forecast was: 302.37 x 1.5 = 454.55. The top hit at PTV=457.4, which is 0.008 from the forecast. Proving once again with REAL TIME forecasts the unmatched power of his techniques. Of course, his other techniques as well as those of Gann can be combined with his PTV to improve this accuracy even more. Many years ago Cowan discovered the PTV (Price-Time Vector). When he published his work in Four-Dimensional Stock Market Structures And Cycles no one was doing anything even similar to it. Years later it continues to work and nail market tops and bottoms with unmatched precision. Below is the SP500 showing Gann's diagonal angles and Cowan's corresponding PTVs. The March 16th post (below) identified the 2x1 angle as the SP500 trend. Because of that trend the PTV tool in CycleTimer is format with the time component x2. The PTVs along Gann's angles are shown below and proves once again how beautifully Cowan's techniques work. The 3/27 top in the SP is EXACTLY 1.5 times (musical fifth) the PTV from the previous top, i.e., 450/300 = 1.5..beautiful! Only readers of Cowan's work are aware of this four-dimensional technique. The SP500 has been following the simple 2x1 Gann diagonal angle since the August bottom. CycleTimer users can simple format their Gann tool for 2x1 and draw the angle to upper right. Then click on the August bottom. You can then move the angle by clicking the Selection arrow, click your starting point, then drag/drop. Simple and effective technique for trend followers. 2/27/2012 - COWAN SELLS HIS QLD FOR 40% PROFIT IN 2 MONTHS! On 12/14/2011 when the QLD (Nasdaq ETF) was at 77 Cowan called the bottom (see below). Today he closed his position for a ~40% profit in 2 months. Students of Cowan know his philosophy of "only a fool holds out for top dollar". More real-time proof of the power of Cowan's timing techniques! 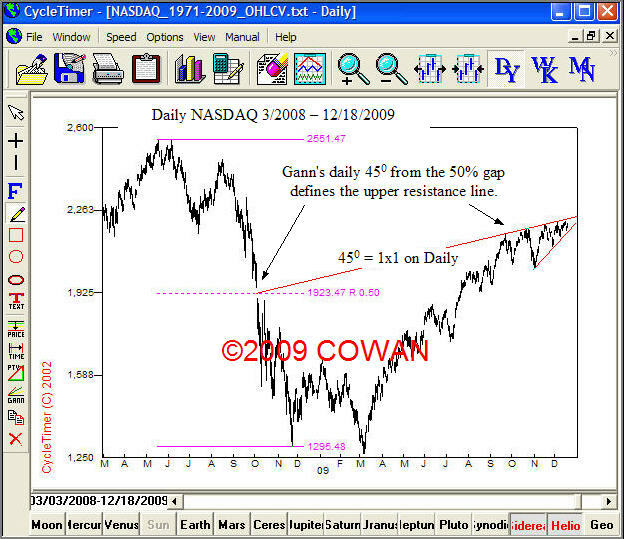 In November, 2011 Cowan showed the ellipse containing the NASDAQ (below). Prices continued within that ellipse for two more months until Cowan called the 12/14/2011 bottom. Two weeks later prices gapped over the ellipse. The QLD (NASDAQ ETF) is already up 25% since Cowan called the Great Pentagram Cycle bottom. 1/3/2012 - COWAN DOES IT AGAIN! NAILS 12/14/2011 BOTTOM! Shows why he has been called "One of the absolute finest stock market analysts in history". Once again...Cowan was dead-on accurate with his cycle forecast posted here on 12/14/2011 (and 12/12). Today the NASDAQ is already up 60 points as it broke out of its compression zone. The day following Cowan's 12/12/2011 post about BIDU it dropped from 130 to 110 (15%) in two days! He warned to tighten stops to lock in profits because the Great Pentagram cycle was due to bottom...It did...right on schedule as Cowan posted. This cycle was discovered by Cowan and is taken right out of Pentagonal Time Cycle Theory (Figure 4.1). It is reproduced below using CycleTimer software. So easy a retarded monkey could do it. Two days ago Cowan identified a triangle that had formed in BIDU and that it was ready for a breakout. Two days later this stock is already down 10% (130 to 116), demonstrating real-time trading rules (buy or short when the line is crossed) resulting in huge short-term profits. 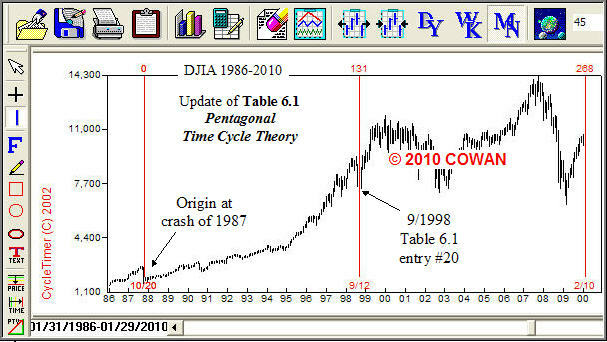 The below chart shows how Cowan's "Great Pentagram" cycles have worked out in the NASDAQ since he published this cycle in Pentagonal Time Cycle Theory. CycleTimer software is used with "now" (12/14/2011) as the starting date. This cycle has been dead-on accurate for over 2 years since Cowan's publication. Market turns can be expected when this cycle arrives at the Great Pentagram in BOTH geocentric and heliocentric . That is why the astute trader will follow his BIDU profits down with close stops. Simple trading techniques showing real-time how easy it is to apply Cowan's techniques. 12/12/2011 - BIDU Has Been Compressing Since July. Watch For Breakout. The chart below shows 3 fractal examples of BIDU compressing into triangles. Two completed with dramatic breakouts. The larger third triangle (red lines) is still forming with a high energy breakout likely after penetration of either of these lines. Elliott Wave analysts look for 5 waves inside diagonal triangles with a breakout to the upside. The magnitude of the breakout is typically equal to the widest part of the triangle, in this case 65 points, or about 50% above current levels. Either way, up or down, a breakout of the red lines will indicate direction. LEARN HOW COWAN FORECAST THE MAY 2011 TOP TWO YEARS IN ADVANCE! Nearly two years before the recent stock market top Cowan published its expected date in Pentagonal Time Cycle Theory (page 127). The below chart uses CycleTimer software to reproduce that cycle. This cycle has special pentagonal significance only explained in Cowan's latest book. This cycle is due to return again in 2013 with even more profound consequences. Anyone following my 4/2/2011 advise (see below) to sell BIDU at 140 and buy back later has already made a lot of money. As forecast, the stock trended higher into a "BULL TRAP" for a few days until taking the Swan Dive down to 124 only 6 weeks after I sold at 139.25. I always sell into strength using market orders. As the chart below shows, prices drop quickly from the top. My re-entry point is ~$15 below my 4/2/2011 sell price, or about 10% in 6 weeks. My PWER trade on November 22, 2010 was again dead on accurate. That bottom at 8 3/4 was followed by a fast advance beyond 12 for a profit of ~40% in a little over 2 months. Because I have received several emails asking when to sell, I am outlining simple techniques not commonly used that any trader can learn. Several years ago I wrote about the Black Swan Formation and successfully demonstrated its application in real-time trading. That work is archived here. 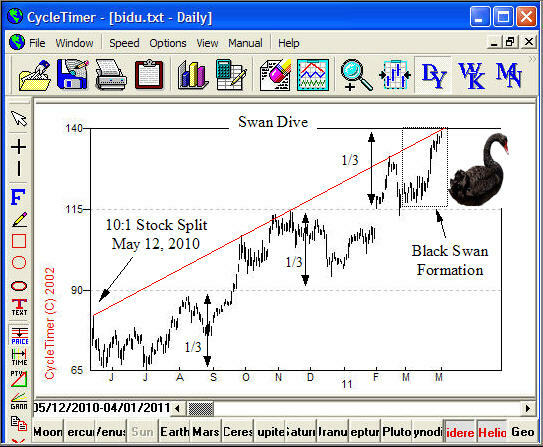 The Black Swan is found in all markets and is shown below in BIDU. It consists of 3 parts; a base-building smooth bottom, a quick mark-up in prices (neck of the swan), distribution (head of the swan). Geometrically, this is an unfolded ellipse. The extent and duration of the Black Swan repeats. The BIDU chart shows the same price and time movement June-July, 2010. Each of these swans divided the entire move shown on this chart into 1/3. The Black Swan typically dives after it forms. Additionally, the upper trend line since the May 2010 stock split has defined the trend. Prices are now near this trend line. Using these simple techniques the trader would sell knowing that the risk/reward ratio was too high, with stops placed above the trend line. Although prices may follow that upper trend line a little longer, the words of the famous American whiskey bootlegger of the 1920's, Joseph Kennedy, are apropos, "only a fool holds out for top dollar". For these reasons and others I liquidated my entire BIDU position yesterday at 139.25. Some was purchased at 69.5 and the rest at 99.25, nearly doubling the earlier purchase in 9 months. I may repurchase in the future. Effective use of technical analysis does not have to be complicated. When a stock is in an early growth phase linear trends and support/resistance levels are much easier to identify. Simple methods of analysis such as Elliott 5-3 patterns can still be used even if you have more sophisticated methods. PWER stock is a good example of this. The daily chart for the past year shows a 5 wave up, 3 wave down pattern with support at the linear "A" and "C" levels. My buy-in on PWER has been in the 8.75-9 level over the past few days. 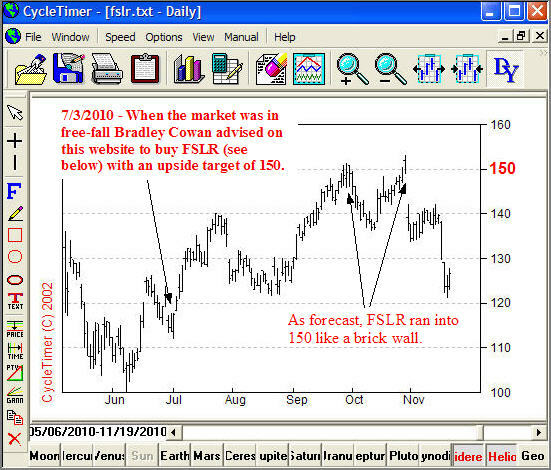 FSLR hits Cowan's 7/3/2010 price target of 150 and plunges, proving Cowan's forecasting techniques work in both PRICE and TIME. On 7/3/2010 when FSLR stock was trading at 120 Cowan forecast here (see below) that it would run up to 150. That price target has been hit twice followed both times by 10%+ drops. Nike is the mythological Greek goddess of VICTORY. Legends say her name was yelled after the battle of Marathon with the Persians. After running the 26.2 miles from the Marathon battlefield to Athens, the runner yelled NIKE!, then collapsed and died. One month ago at the 7/2/2010 bottom every talking head on the airwaves was in full panic mode calling for a "double dip" recession and much lower prices. (See chart below). The CNBC Clueless Club cited the "death cross", as they called it, of the 50-day moving average crossing the 200-day. 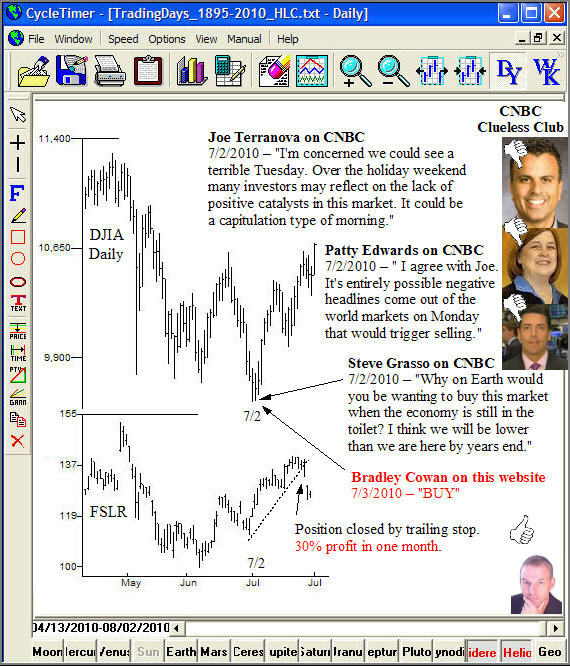 The rampant pessimism can be seen by watching this CNBC video recorded on 7/2/2010, www.cnbc.com//id/38058478. While the CNBC Clueless Club was calling for more selling, Cowan made his first BUY recommendation in 3 months, giving FSLR stock as a good example. His accumulation price was 100-105, and when made public on 7/3 FSLR was trading at 120. FSLR immediately shot up to 140 three weeks later, for a quick profit of 16% from 120, and 40% profit from 100 a month earlier! As is always the case, the position was followed by trailing stops. This lets the market decide when to close the position. FSLR stock - A textbook example of stock manipulation. "Never play another man's game." That was the lesson my father taught me when I was 11 years old and he took my life's savings of $12 by gambling on the game of checkers. He knew he could not beat me at chess so he talked me into gambling on a game I knew nothing about, checkers. After a series of "double or nothing" losses, my $12 belonged to him (which he kept) and his words "never play another man's game" belonged to me. FSLR (shown below) is a good example of smart money manipulating the public into "playing their game" by issuing buy recommendations as they distribute their stock. FSLR had been in a downtrend since 2007 until it was broken at $112 on high volume on March 26, 2010. The volume indicates that the smart money was buying, yet no "buy recommendations" were issued at that time. A month later FSLR was at 152 and 5 different brokerage firms issued "strong buy" recommendations to the press. Volume spiked as they distributed to the public the stock they bought a month earlier. Prices immediately tumbled all the way back to the trend line at 100. When you listen to "buy" or "sell" recommendations you are playing another man's game, and you are certain to lose. The charts never lie. All the manipulation is recorded in the price and volume action for the sharp eye to discover. I have been accumulating FSLR for the past 2 months whenever it drops down to the declining trend line, typically in the 100-105 price range. Upside target is when it returns to the October 2009 gap around 150. DEAD-ON-ACCURATE PUBLIC MARKET CALLS MADE ON THIS WEBSITE! "It's been exactly one year since I came out of hibernation and made my first public market call in many years, calling the bottom on this website. Since then, three other market calls have been posted here within the past 3 months, all of which were dead-on-accurate resulting in HUGE profits for those following the trades. All calls were based on simple, easy to understand, applications of cycles and Gann. All cycle dates were calculated by CycleTimer. There was nothing complicated or time consuming about it. A trained monkey could have done it. The real-time examples posted here for the past year put to rest once and for all any questions of the efficacy or difficulty of Cowan's techniques. Critics of Cowan's cycle work are more making a statement about their own limited abilities than these publicly proven techniques. People who can not understand the techniques I demonstrated below should not be trading." "More recently, the 2/10 cycle bottom I posted here on 2/5 (see below) came in right on schedule. The QLD (NASDAQ trading ETF) is up 18% in less than a month since 2/10! A trained monkey could have dragged his mouse crosshairs over to the 10/20/1987 bottom as I demonstrated and arrived at the same result." Readers of Pentagonal Time Cycle Theory understand that the current decline in the stock market arrived right on time. Review the 9 degree harmonics of Table 6.1. Or, more simply, just enter 45 degrees in CycleTimer, as shown below, with the start date at "now". The same result is obtained by setting the cycle start date to the reopening of the stock exchange in 12/1914, advancing at the rate of 45 degrees. You will see the cycle originating at the crash low of 1987 (or 1914) hit again at the 9/1998 low, and now. On December 21 Cowan posted (below) the two trendlines defining the NASDAQ. He told traders to buy when the upper 45 degree Gann line was broken followed with trailing stops. And to short when prices fell below the lower trendline. The below chart updates the action since then. DOUBLE BULL'S EYE! Immediately after the posting, prices completed the 4th Elliott Wave and ran up 100 points in 2 weeks. The top was reached when the two trendlines converged in time, as is typical of compressing 4th wave triangles. Following Cowan's second recommendation to short when the lower trendline was broken at 2280, traders have since accumulated another 140 points in a little more than one week! 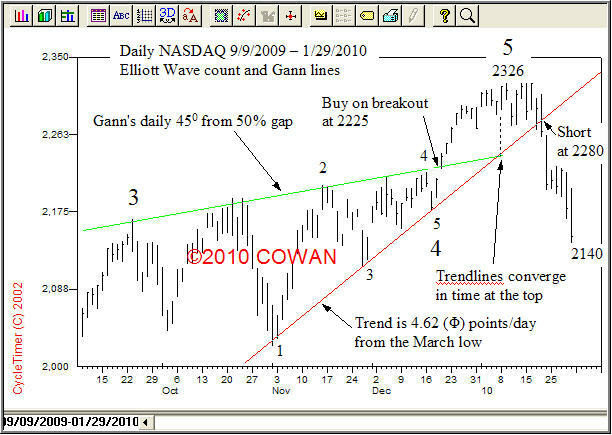 LEARN HOW COWAN CAUGHT THE FALLING KNIFE AT THE 3/6/09 BOTTOM! The general consensus is that you don't try to "catch a falling knife". That is, don't try to call a bottom, just trade the trend. For most traders that is good advice. But Cowan has a proven track record of doing just that, calling tops and bottoms as they occur real time with uncanny accuracy. He did it again on March 5, 2009. Using CycleTimer software and the techniques taught in his courses Cowan made his first public market call in many years. He called a bottom and advised traders to buy immediately. The post was made here FOUR TRADING HOURS before the actual bottom and can be seen below in its original form. Educate yourself so that you can make your own informed decisions. If you are basing your trading or investing decisions on anyone other than yourself you are making a huge mistake. Just look what the so called "experts" were telling their audiences at the bottom in March. COWAN RAISES STOP TO 7250 LOCKING IN 650 PTS PROFIT! "This is a powerful long-term cycle that I explain in Chart VIII.I in my book. It has moved exactly 180 degrees from the 1987 crash low. Anybody that has my books and didn't profit from this rally should kick themselves. I would love to see it pull back and take out my stop so I can buy lower. But I wouldn't be surprised if this doesn't happen until 8000 is hit"
Position closed BY trailing stop at 7250. Trade result IS 650PTS PROFIT IN 7 TRADING DAYS. WILL BUY BACK LATER TO CONTINUE THIS POWERFUL UP CYCLE. TODAY COWAN RAISES STOP TO 7150 LOCKING IN 550 PTS PROFIT! 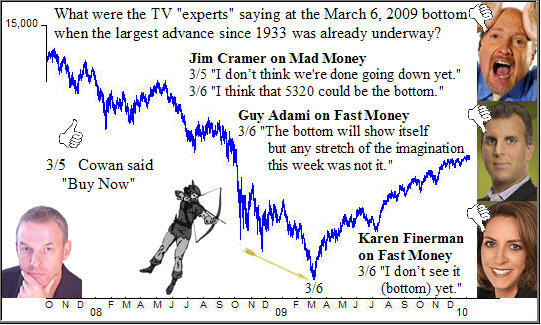 On 3/5/2009 when the market was below 6600 and still falling the CNBC talking heads were cowering in fear in their makeup rooms. No one was calling a bottom. FOUR HOURS before the actual bottom on 3/6 Cowan made his first public forecast in many years right here on this public web page, open for all to see, telling investors to buy now. The original unedited posting is below. One week later Cowan has raised his stop to 7150 locking in 550 points profit in one week! Re-entry is possible later if the stop is taken out. It is Cowan's view that the recent plunge in stock market prices should not be seen as a source of fear, rather a rare opportunity to buy quality companies at panic low prices. Investors at these levels will thank their lucky stars. Many stock market cycle clusters arrive in March. One studied in the course is the slow moving Saturn-Uranus, plotted below with CycleTimer software, moving 180 degrees from the 1987 crash low.